Dyes are an important class of recalcitrant organic compounds, with a broad range of applications in the textiles and clothing industry. It is estimated that almost 2% of the dyes produced annually are discharged directly onto aqueous effluents through manufacturing and processing operations, and nearly 10% is subsequently lost during the coloration process. The presence of dyes in industrial wastewaters can create a host of environmental problems because of their potential cytotoxic, carcinogenic, and mutagenic effects on human health, as well as on general flora and fauna. Amongst the various physical, chemical, and biological techniques that are currently explored by the scientific community for the removal of dyes from aqueous medium, adsorption on activated carbon (AC) is widely considered as the most effective and promising option. However, commercially available ACs are fairly expensive and are often produced from non-renewable coal based resources, which make them economically undesirable and environmentally unsustainable. Consequently, there is a growing interest to synthesize ACs from renewable agricultural waste, which is conceived to be sufficiently abundant. Particularly, attributing to their high lignocellulosic composition and low ash content, date palm residues (such as fibers, seeds, rachis, fronds, etc.) as low cost precursors for manufacturing ACs are being intensively investigated in recent years. Compared to the commercial AC, the ACs derived from date palm byproducts exhibit superior textural characteristics, and, subsequently, greater adsorption capacity toward a plethora of dyes. Clearly, solicitations of date palm biomass, as a base feedstock for the mass production of AC, can not only solve the waste disposal crisis in date palm growing countries, with a beneficial and enhanced revenue potential, but may also contribute in regulation of the unsustainable management of the waste byproduct. 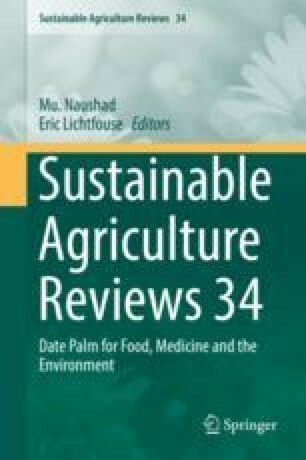 This chapter targets this aspect amongst others, with an objective to provide a systematic overview of the recent progress in the development and application of date palm based ACs for decolorizing textile effluents. Furthermore, it attempts to segregate and identify the key gaps in the specific domain knowledge, and lays out novel strategic research guidelines, for making further advances in this promising approach, to a hitherto sustainable development.